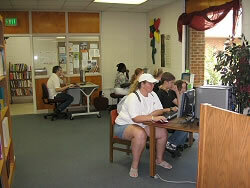 The Erwin Public Library provides internet access to the public. We are limited on our use of chat rooms, myspace and adult sites because of children. Our patron’s are not permitted to access any internet site that may be offensive or obscene to anyone. The computers offer a variety of educational games for the children. There is a time limit of twenty minutes per use if an individual is waiting for his or her turn. At the present time we have six computers for the public. Black/white printing is available with a charge of ten cents per page. All pages printed must be paid for. Users are not allowed in anyway to harass other users, damage computers or chairs and will be responsible for any malicious damage to hardware or software. Violating copyright laws or software license restrictions is prohibited.